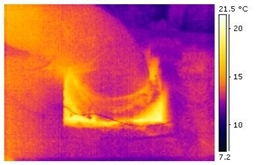 Heating duct insulation can save you a pile on heating and cooling costs. Poorly sealed or insulated heating ducts can leak hot air to areas that don’t need heat, such as attics or a crawl space, increasing your home heating costs. Make sure you know the basics, and get heating duct insulation where you need it. The same benefits apply to properly sealing and insulating your ductwork for the purposes of air conditioning. There’s no point in pumping cooled air into your hot attic in the summer, or letting heat from the attic warm the air in the ducts if you don’t have HVAC duct insulation. Seal and insulate! Warning: In some older houses, metal heating ducts were wrapped with asbestos insulation fabric, which looks like thick, yellow or grayish paper. Asbestos is an extremely toxic substance if touched or inhaled but poses little risk if left in place inside undisturbed walls. If you encounter ductwork in your house that is wrapped in this material, stop all work and consult a professional HVAC contractor for help! Through an attic, if a central air conditioning system with separate ductwork was installed after an existing radiator or electric baseboard heating system was already installed. There are two forms of energy loss from your heating ducts: heat transfer through escaping air, and heat transfer through the metal of the heating ducts. Heating ducts are installed in sections, and the sections are either sleeve-fitted together, or, for rectangular ducts, built in overlapping sections. For metal ductwork, the sections are then screwed together with metal screws, and may also be taped together to improve the connection and provide a better seal. The holes introduced by screws may also be sealed with a duct sealant. Metal ductwork can come unsealed due to impacts (such as demolition work during a renovation), or may not have been properly installed in the first place. Screw connections can leak small amounts of air, while seams between sections can leak larger amounts if the seams open up. Sections also have seams along their length, which in worn-out ductwork may come loose and allow parts of a section to escape air out the seam. Improperly sealed ducts can cause the air warmed by your furnace to escape into unheated sections of your house, which wastes energy. Moisture in the heated air, when escaping to an unheated attic or garage, may introduce humidity (from your furnace humidifier or simply from the fact that the air is recirculated from a living space where humidity levels are higher due to people breathing, cooking, showering and so on). This humidity may condense in the cold areas of your attic or garage, and may cause problems of mold, rot, or matting down of insulation, thus reducing its effectiveness. Air leaking through ductwork into interior walls is less of a problem, but moisture build-up within the walls is still a concern. Also, any holes drilled for wiring through the top plate of a wall that abuts your attic may allow air to escape, first from the ductwork into the stud space, then into the attic through the hole. If you are renovating a room and your renovations expose the ductwork, it’s worthwhile checking that the ductwork is solid and well-sealed. If there are serious air leaks in the ducts you may want to consider expanding the scope of the renovation and hiring a sheet metal or HVAC contractor to repair or replace the leaking ductwork. While no one wants a simple drywall job to expand into a major HVAC overhaul, there are times when a routine reno exposes serious problems, and drywalling over the problems will only make things worse. Better to fix everything while the walls are open. It’ll save a second gutting and reno later on. Any heating duct that travels in unheated (or uncooled) areas runs the risk of losing its heat in winter, or picking up unwanted heat during the air conditioning season, if it is not properly insulated. Uninsulated ductwork can cause you to lose 10-30% of the energy used to heat and cool your home, according to the Energy Efficiency and Renewable Energy office of the US government (EERE). 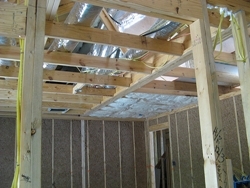 When a central air conditioning system is installed in a home that already has central radiator-based heating or electric baseboard heating (in other words, a house that doesn’t already have forced air ductwork), the installers may choose to route the ducts for the upstairs or attic facing rooms through the attic, as this involves fewer cuts into and repairs of wall cavities, and is therefore cheaper and less disruptive. If the ductwork was installed by a reputable contractor, they should have ensured that any sections passing through unheated or uncooled sections of the house were properly sealed and insulated. Metal conducts heat very efficiently, so cold air passing through your heating ducts in a hot summer attic or crawl space will pick up heat from the attic; conversely, warmed air passing through heating ducts in a cold winter attic or crawl space will lose heat and provide less comfort to the rooms the ducts travel to. Generally your attic should be insulated to R-49 except for the warmest US climates, where R-38 or R-22 may be acceptable (see Attic ceiling insulation for more details – and remember that more is always better). 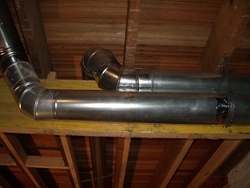 Ductwork traveling through attics should be as close as possible to the heated or air-conditioned space below, and insulated similar to the attic, but at an absolute minimum should be covered with at least R-11 insulation. Heating duct insulation may be wrapped around heating ducts in unheated spaces, but this insulation is typically only R-4 to R-6. Researchers have found energy losses of 20-35% for rooms whose registers are accessed through ductwork passing through unconditioned spaces; the losses are combined conduction losses (through metal) and air exchange losses (through leaks). Adding proper attic insulation above the heating duct insulation will cut energy losses significantly. Newer homes often have non-metallic ductwork installed, because it does not have the conduction properties of metal, and because sections of it can be more easily formed to custom shapes and splits. These ducts are already insulated, and so heating duct insulation is not usually wrapped around them. However, this ductwork has similarly low R values to the heating duct insulation around metal ducts, so again you’ll save energy by ensuring the space around such ducts, where they travel through unheated space, is well insulated. If your basement is unheated, or at least is unfinished and therefore you do not go down there much in winter, there’s no point in letting heat escape from the ductwork and warm your basement when it could instead be warming the rest of your house. For these areas, heating duct insulation is a good solution. It provides a moderate level of insulation at relatively low cost. The heating duct insulation shown at left is a spiral wrap insulation meant to go around cylindrical heating ducts, although you can cut and tape it onto rectangular ductwork as well. Just make sure the ductwork is properly sealed before you insulate it, as leaks in the ductwork can damage the heating duct insulation through the introduction of humidity. As mentioned at the start of this article, home ductwork installed decades ago was sometimes wrapped with heating duct insulation made of asbestos. This product has the appearance of a thick, flexible and easily torn paper. If you discover heating vents wrapped with this paper during a renovation, stop all work and call a qualified HVAC installer or a licensed asbestos removal company to have the paper assessed for the presence of asbestos. Remember that it is both extremely unhealthy, and in most jurisdictions illegal, to attempt to remove this material without the proper precautions and permits. Disposing of asbestos heating duct insulation in a renovation waste dumpster, in your garbage, or at the local dump, is also illegal and endangers the health of sanitary removal workers as well as the general public and yourself. Other risks of heating duct insulation are that, where fiberglass heating duct insulation is used, there is a risk that some of the small fiberglass strands may get into the ductwork and from there travel into the living spaces where people could then breathe the fibers in.